The numerically controlled oscillator, or NCO object generates real or complex sinusoidal signals. The amplitude of the generated signal is always 1. Create the dsp.NCO object and set its properties. nco = dsp.NCO returns an NCO System object™, nco, that generates a multichannel real or complex sinusoidal signal, with independent frequency and phase in each output channel. nco = dsp.NCO(Name,Value) returns an NCO System object, nco, with each specified property set to the specified value. Specify the source of the phase increment as 'Property' or 'Input port'. Specify the phase increment as an integer-valued scalar or vector. This property applies only when you set the PhaseIncrementSource property to 'Property'. Specify the source of the phase offset as 'Property' or 'Input port'. Specify the phase offset as an integer-valued scalar or vector. This property applies only when you set the PhaseOffsetSource property to 'Property'. Set this property to true to add internal dithering to the NCO algorithm. Dithering is added using the PN Sequence Generator. Specify the number of dither bits as a positive integer. This property applies only when you set the Dither property to true. Set this property to true to enable quantization of the accumulated phase. Specify the number of quantizer accumulator bits as an integer scalar greater than 2 and less than the accumulator word length (CustomAccumulatorDataType). This property determines the number of entries in the lookup table of sine values. This property applies only when you set the PhaseQuantization property to true. Set this property to true to output the phase quantization error. Specify the type of the output signal. Specify the number of samples per frame of the output signal. When the PhaseOffsetSource property is 'Input port', and the PhaseIncrementSource property is 'Property', the number of rows or frame size of the phase offset input determines the number of samples per frame of the output signal. When you set both the PhaseOffsetSource and PhaseIncrementSource properties to 'Input port', the number of rows in the inputs must be 1, and the samples per frame of the output signal is 1. Specify the output data type as 'double', 'single' or 'Custom'. When you select 'Custom', you must also set the CustomOutputDataType property. This constant property has a value 'Floor'. This constant property has a value 'Wrap'. This constant property has a value 'Custom'. Specify the accumulator fixed-point type as an unscaled numerictype object with a Signedness of Auto. Y = nco() returns a sinusoidal signal when the PhaseIncrementSource and the PhaseOffsetSource properties are both set to 'Property'. Y = nco(phInc) returns a sinusoidal signal, Y, generated by the NCO with the specified phase increment, phInc. Y = nco(OFFSET) returns a sinusoidal signal, Y, with phase offset, OFFSET, when the PhaseOffsetSource property is set to 'Input port'. Y = nco(phInc,OFFSET) returns a sinusoidal signal, Y, with phase increment, phInc, and phase offset, OFFSET, when the PhaseIncrementSource and the PhaseOffsetSource properties are both 'Input port'. phInc and OFFSET must both be row vectors of the same length, where the length determines the number of channels in the output signal. [Y,cosine] = nco(___) returns a sinusoidal signal, Y, and a cosinusoidal signal, cosine, when the Waveform property is set to 'Sine and cosine'. This syntax can include any of the input arguments in previous syntaxes. [Y,qErr] = nco(___) returns a sinusoidal signal, Y, and output quantization error, qErr, when the PhaseQuantization and the PhaseQuantizationErrorOutputPort properties are both true. Phase increment, specified as a scalar or a row vector, where each element corresponds to a separate channel. When both PhaseIncrementSource and PhaseOffsetSource properties are set to 'Input port', the two inputs, phInc and OFFSET must have the same number of channels. This property applies only when the PhaseIncrementSource property is set to 'Input port'. Phase offset, specified as a row vector or a matrix. The number of rows of OFFSET determines the number of samples per frame of the output signal. The number of columns of OFFSET determines the number of channels of the output signal. When both PhaseIncrementSource and PhaseOffsetSource properties are set to 'Input port', phInc and OFFSET must have the same number of channels. This property applies only when the PhaseOffsetSource property is set to 'Input port'. The number of channels in the output signal is determined by the number of channels in the phase offset and the phase increment signals, which must be equal. The data type of the output is determined by the OutputDataType property. Cosinusoidal signal, returned as a vector or a matrix. The cosine output signal has the same size and data type as the sinusoidal signal, Y. Output quantization error, returned as a vector or a matrix. The qErr output signal has the same size as the sinusoidal signal, Y. This output is only available when both the PhaseQuantization and the PhaseQuantizationErrorOutputPort properties are set to true. Design an NCO source according to given specifications. Calculate number of accumulator bits required for the given frequency resolution. 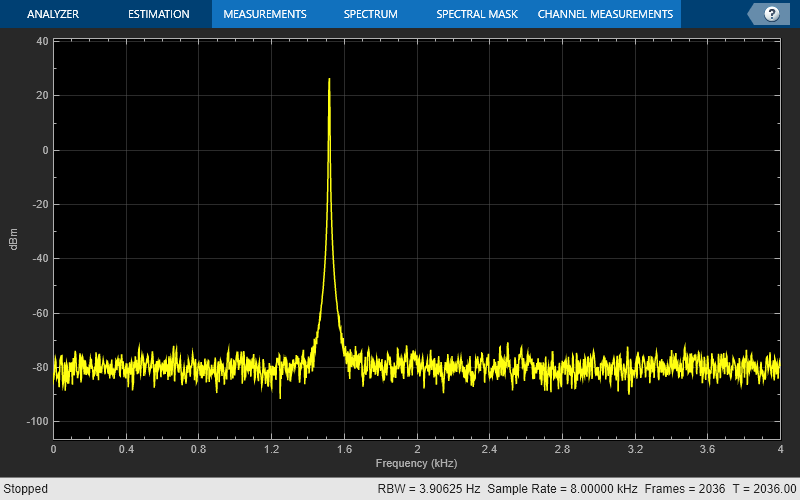 View the output of the NCO source on a spectrum analyzer. Change the output frequency in the middle of the simulation from 510 Hz to 1520 Hz. NumPointsLUT — Number of data points in the lookup table. SineLUTSize — Quarter-wave sine lookup table size in bytes. TheoreticalSFDR — Theoretical spurious free dynamic range (SFDR) in dBc. FrequencyResolution — Frequency resolultion of the NCO. To obtain the above characteristics for a specific NCO object, call the info function on the object. The fields and their corresponding values change depending on the settings of the object. For instance, if the PhaseQuantization property is set to false, the TheoreticalSFDR field does not appear. This object implements the algorithm, inputs, and outputs described on the NCO block reference page. The object properties correspond to the block properties, except there is no object property that corresponds to the Sample time block parameter. The objects assumes a sample time of one second.